It was not love at first sight. Not at all. In fact it was a most disturbing experience. 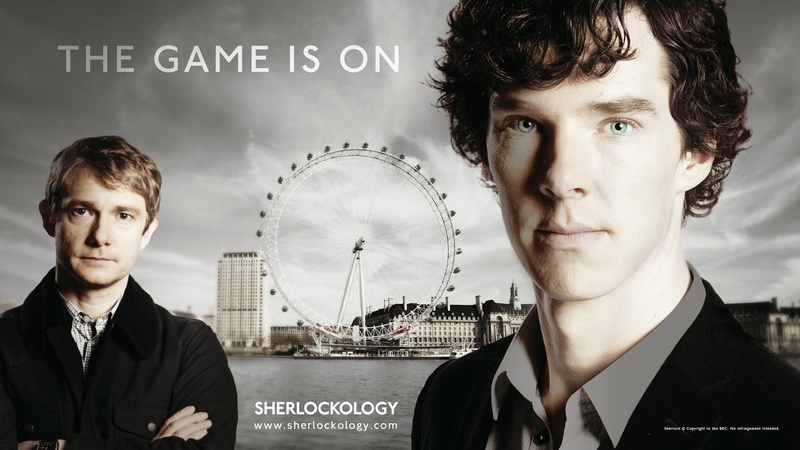 Don’t know why I tuned in when BBC’s “Sherlock” first aired on German television. Maybe it was one of the boring evenings you give something different a try. Before you go to bed with a good book. Or no book at all. But this try was an absolute failure. First episode of the first season “A Study in Pink” starts with another nightmare of Dr. John Watson. He (as in the original books) came invalided home from Afghanistan trying to find his way back to civil, normal life. But of all these facts I simply had not the faintest idea. I expected to get a typical Sherlock Holmes scene in a typically old fashioned British flat, with the typical hat and a pipe of course. This had always been this way. At least for me who hadn’t read anything of Sir Arthur Conan Doyle and just had a very, very vague knowledge of the famous detective mostly gathered and stored in the deepest corners of my memory through old TV films. And now this: soldiers, war, shooting, screaming, noise, a man haunted by all of his memories, breathing deeply in terror, unable to sleep – I turned telly off. But somehow I stumbled across “Sherlock” again – blaming a colleague with whom I chatted about the must read-books and crime stories in general. “You have to watch ‘Sherlock’”, she insisted. “It’s brilliant, it’s funny – you’ll simple love it and it’s just on a replay on TV.” So in the summer of 2012 I gave it another try and spend warm summer evenings nailed in front of my TV, anxious not to miss a single word and with my recorder ready for later replays. When I finally got the original DVDs from the BBC I didn’t know that I made a decision that haunted me ever since. I first entered the illustrious company of Sherlockians (and the Cumbercollective which devoted me to Sherlock actor Benedict Cumberbatch) and second sent me on an adventure to discover the original works of Sir Arthur Conan Doyle. Stories that inspired Steven Moffat and Mark Gatiss, creators of “Sherlock”, to bring the famous detective to the 21st century. “It’s love. We love Sherlock Holmes so much. It’s an exercise in love,” said Steven Moffat about their work (in Media Guardian Edinburgh International Television Festival 2012) trying to convince Holmes and Doyle fans that they never intended to handle their heroes with disrespect. Understanding that Moffat and Gatiss – who are long termed friends and colleagues working together on different episodes of BBC’s “Doctor Who” – are trying to get to the fundamental idea that lies underneath these stories and gets new fans closer to the original core. Says Moffat: “Conan Doyle’s stories were never about frock coats and gas light; they’re about brilliant detection, dreadful villains and blood-curdling crimes – and frankly, to hell with the crinoline. Other detectives have cases, Sherlock Holmes has adventures, and that’s what matters.” („Sherlock unlocked,” BBC, 2.Series, DVD). They believe that with every new movie version, there came a sort of “Victorian pastiche” lying over the characters. “We came to the conclusion that the best way to do it, was to strip all that away and just do it now. The characters live and breathe in the modern days”, explains Gatiss on how they brought Sherlock Holmes back to life. A life that was as fascinating and thrilling as it has been to the contemporary readers of the original canon who wondered how Holmes could solve crimes simply by observing and using his incredible leaps of logic. And Sherlock Holmes today is still the only man in the world who has this abilities. “Doyle and Sherlock Holmes created an awful lot of things we take for granted in terms of police forensics. So we couldn’t pretend that this all haven’t happen. What we’ve done is to make sure that the police take care of all that. And what they can’t do is make them magical with that incredible leaps of logic that only Sherlock Holmes can do. He’s still the only man in the world who has this brain”, says Mark Gatiss (“Unlocking Sherlock”, BBC, 1.Series, DVD). Having all this in mind and knowing that they have been brooding about a modern day Sherlock Holmes for years, a traditional fan may find his peace with the series which third series is already filmed and in post-production. Yet no air dates are officially announced due to the BBC which will schedule the series after all finished episodes are delivered to them as Sherlockology is explaining. “This is not Sherlock Holmes updated. Honestly I think this is Sherlock Holmes restored. audience in the first place. And we brought it back to that. Fans who simply fall in love with “Sherlock” because they get hooked by a brilliant Sherlock in the name of actor Benedict Cumberbatch (getting famous outside Britain through the movie “Star Trek into Darkness”) who matches perfectly with Martin Freeman’s John Watson (who as „The Hobbit“ has the movie of his life) find not even a new favourite TV series and a fandom prepared to discuss and share every second of every episode, including speculations about how and when the show will be continued and if the careers of the main characters will let them find spare time to film new episodes in the future at all. But these fans will also find a sort of second world lying behind the BBC series, shining through, luring to get more addicts. „Sherlock“ is not just fangirling around (there are rumours that there are men who love it, too). Unlike most other series each episode is 90 minutes long which gives it the impression of a movie and like a movie each one is a story within itself. But one will not fully understand the special relationship between Sherlock and John if one has not met them at the beginning. And one will simply not manage to focus only on this series because sooner or later one wonders how this scene or this dialogue or this strange Sherlock behaviour took place in the underlying world of Sir Arthur Conan Doyle’s works. And without this world the modern settings and dialogues simply wouldn’t work. As in the original canon John and Sherlock are looking for a flatmate to share rooms in the famous address 221B Baker Street.But in „Sherlock“ we meet two handsome young men in their late 30s or early 40s. „We’ve never seen them so young“, says Steven Moffat and we’ve never meet them in our contemporary time – giving room to all sort of speculations. „There’s another bedroom upstairs in case you’ll needing two bedrooms“, explains Mrs Hudson when Sherlock and John take a first look at their later flat (Sherlock, A Study in Pink). „Of course we’ll be needing two bedrooms!“, John replies and starts a running gag that will be popping up every now and then throughout the series. But the question of whether they are gay or not (John never misses an opportunity stating that he isn’t whereas Sherlock mostly just doesn’t care about this ordinary question and probably believes this is boring) is not the only thing that is in need of an explanation when transforming Sherlock Holmes in the 21st century. Although the flat and its interior is slightly old fashioned and mostly could have been this way since the last century, Sherlock is a very modern man. He searches the internet, he texts, he writes emails, he has a website, he watches telly (and corrects it). But he also plays the violin and composes when he’s thinking, sometimes doesn’t talk for days on end („I get in the dumps at times, and don’t open my mouth for days to end“, says the original Sherlock Holmes, „A Study in Scarlet“) and is slightly autistic not only when trying to solve a crime – attitudes picked up from the original character and translated in a modern language. This language is speckled with quotes invented by Sir Arthur Conan Doyle – the genius writer as Mark Gatiss often points out in various interviews – which are carefully handled like archaeological artefacts, cleaned from dust and given a new place to adore them. So as John for example rumbles over Sherlock’s ignorance about the solar system („It’s primary school stuff! How can you not know that?“ Sherlock, The Great Game) Sherlock impatiently shouts that if he ever had known it, he deleted it. Because his brain is „my hard-drive, and it only makes sense to put things in there that are useful. Really useful. Ordinary people fill their heads with all kinds of rubbish, and that makes it hard to get at the stuff that matters!“ (Sherlock, The Great Game) intending that only a sorted memory will be able to give him the information he needs when he needs it. Of course there are no hard drives in Sherlock Holmes’ Victorian London and probably the word has even not been invented. But the original character considers „that a man’s brain originally is like a little empty attic, and you have to stock it with such furniture as you choose. A fool takes in all the lumber of every sort that he comes across. (…) Now the skilful workman is very careful indeed as to what he takes into his brain-attic.“ (Sir Arthur Conan Doyle, A Study in Scarlet) – and he also doesn’t care if the earth goes around the sun. Reading the originals, watching „Sherlock“, discovering the parallels and the references in the episodes which pay respect to Doyle’s work is part of the Sherlockian fandom which could and will never exist without the original and will bring more readers to the fantastic works of Sir Arthur Conan Doyle. This version is slightly updated.